A lot of kids grow up playing different sports and figuring out which ones they like, and in some cases they fall in love with one. The game becomes a part of them and that kid goes on to practice it for years, figuring out how they want to play it and what they’re good at, then practicing even harder to improve themselves. In some cases, the game also can improve you as a person and give that person a focus on what they want in life and how to persevere, pursue, and prosper. 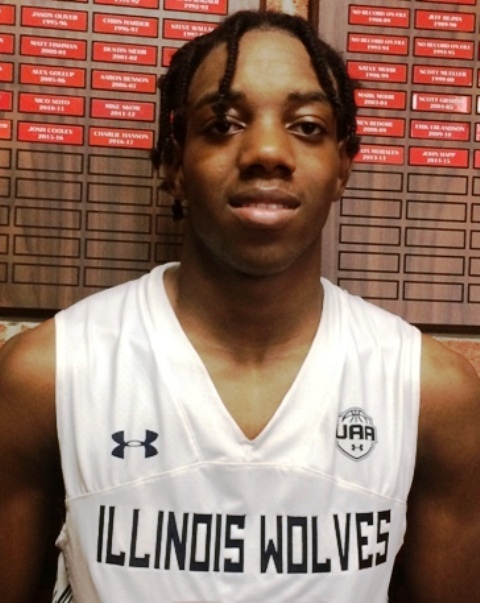 2019 point guard, Marquise Kennedy (IL Wolves – Brother Rice H.S. – University Park, IL) has dreams of playing basketball at the next level and using that opportunity to improve himself on and off the basketball court. With that goal in mind, Kennedy has also made himself into one of the area’s top guards and has picked up some good offers along the recruiting trail… offers that led to maybe the biggest decision of his young life. Kennedy is a quick and fast guard who mans the point spot with a lot of confidence. Over the summer he displayed a really nice feel for the position and showed he is able to affect the game in that role in a variety of ways. The 6’1”, 175-pound lead guard can take defenders to the hoop using his speed and quickness and then finish, or he can blow by, attract defenders and make the right pass. Kennedy also commented on his abilities saying “my strengths as a player are my jumping ability and my speed… I think I have a very good feel for the point guard position where I’m a great passer, and I can read and create plays.” Kennedy put those skills and that ability to make others around him better on display throughout the grassroots season and over the last couple years. Something he continues to look at improving though he says is his shooting, making his outside shot more confident and consistent. As his final high school season gets underway in the coming months, Kennedy has his sights set on a big year with his team. “This upcoming season, my goal is to win the Catholic League and then go down to state,” the talented point guard stated. While he and his team work towards that goal, Kennedy will also have a big decision to make about his future at the next level. The start of that opportunity will come as a Loyola-Chicago Rambler.